Over the last few years I have taken part in several interviews and also a video recording of one of my talks was made in 2005. Here are some preliminary ideas I put together in preparation for that interview based on questions that were planned. This DVD is a video recording made by James Asher at Devaura, Aura-Soma Centre in Lincolnshire Summer 2005. 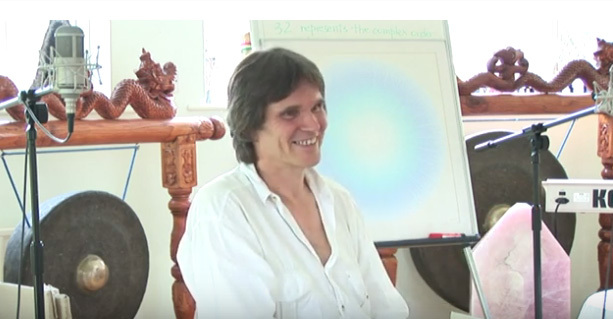 Barry gives a general introduction to his experience, understanding and approach to mandalas. The DVD has a small booklet insert based on a question and answer session which took place Summer 2007. Mandalas are universal images which can be found all over the world and beyond.They exist in the West, notably in the rose windows of cathedrals, and other forms of sacred art. They have been explored and developed to an exceptional degree in the East, especially in the Tibetan and Indian cultures and they are widely used in American Indian rituals. Mandalas are found everywhere in human culture especially where awareness of unity is understood and celebrated. They occur abundantly in nature from the infinitely small as in atomic structures to the infinitely large as in galaxies. They are widely used for meditation and healing. 1. Recently I read your book Sacred Circles where you describe a mandala as being "a personal journey in that the mandalas are painted by individuals in a particular time and place and it is a transpersonal journey in that the principals which are an integral part of the mandalas are universal and timeless." What does this statement mean? Mandalas have both specific and universal aspects. The universal aspect is that which connects the mandala with The Source or The Divine. My view is that the circle is a symbol especially associated with the Source because as an image it is perfectly balanced. However I did not come to this understanding through any intellectual process. As I say in my book “The circle dropped into consciousness”. This occurred at a time in my life when I was experiencing a unified state of consciousness and considering how to translate the experience into this relative or apparently relative dimension. This was what I call an “intuitive insight”. I have limited interest in explaining why I experience the circle as a symbol of The One though it is interesting to note that in terms of numbers the circle and zero are rather similar if not identical. In this context it might be true to say that they both correspond to a state prior to manifestation or differentiation. From my standpoint when dealing with symbols it is important to give plenty of opportunity for “intuitive insight” because the deepest insights come from within and to a certain extent bypass the mind altogether. Seeking to understand “intuitive insight” is counterproductive. Part of the power of symbols as distinct from words is that symbols activate “intuitive insight”. Historically, culturally and geographically mandalas and the circle are found universally because they correspond to that part of human consciousness which was termed by Jung “The Collective Unconscious”. In the Jungian context it corresponds to that part of consciousness which existed prior to the development of individual consciousness. From my standpoint the universality of the mandala in one form or another is based on the understanding that the Source is manifesting everywhere and to a lesser or greater extent this understanding or realization has arisen in all cultures. Can you elaborate on your definition of a mandala? A mandala is a circular image which touches into the universal and conveys a quality of Centredness, Peace and Oneness. Just at what point a circular image ceases to be a circular design and becomes a mandala is difficult to specify. This is because perception is very if not totally subjective. So for instance when William Blake saw heaven in a flower he was perceiving a flower in a way that not everyone sees a flower. Likewise someone might look at a circle on a piece of paper and see just a circle and another person might see a symbol of The One. However speaking generally I would say a mandala is an image which expresses and facilitates awareness of Unity, Peace, Truth and Love which as I understand it are all names for the same essence. 2. Would you say that creating a mandala is therapeutic and if so why? When we create a mandala we are tuning into and placing ourselves in the presence of the energy of the mandala and all that is associated with it. It is a meditative process and as such helps open the person concerned to the healing energy of the mandala. This can be understood and approached in a variety of ways. In the general context expressing oneself through artistic expression can be very therapeutic purely in terms of allowing oneself the freedom to be creative and express and go with whatever arises. A lot of “Art Therapy” works with this idea. Related to that is the understanding that the process can reveal and explore parts of the consciousness which are partially or totally unconscious. This can be very revealing and help a person understand themselves more deeply. The mandala is a specific art form and as such involves working with certain principles. At the very least I would say it involves being aware of and placing oneself in the energy field of the circle. However even a simple principle like that can be limiting. When approaching art in general or the mandala in particular in a therapeutic context it is important to find a balance. The symbol most strongly associated with that is the yin yang. The yin yang embodies and expresses the principle that all polarities are closely related and contain within themselves the seed of their opposite. So I would say that in the context of the mandala as a therapeutic tool it is helpful to work with certain principles associated with mandalas such as for instance geometry and colour harmony but also allow plenty of freedom. It is a dance which explores focus and surrender, holding on and letting go. I see the therapeutic process as open ended. My understanding is that true healing is found within as a state of Oneness. The process which enables that understanding to arise could be referred to as The Healing Journey which I would say is synonymous with The Spiritual Path. 3. Can anyone create a mandala and if so are there any steps or processes involved? I would say that anyone can create a mandala. In that context I have given many mandala workshops over the last 20 years. To facilitate this I generally start with a meditation or an introductory talk followed by a meditation. The idea is to help people get in touch with their centre which is one with the universal centre and in so doing connect with the source of creativity. How I have approached this has varied over the years. Sometimes I have accompanied the meditation with some form of guided visualization during the meditation or suggested specific images or symbols before the meditation. As well as getting in touch with the mandala as an inner experience people generally need help with technical considerations though not always as it is perfectly possible to create a free form mandala without getting involved with geometry. However often the aspiration arises to create a mandala which is symmetrical and this can be greatly helped by an understanding of a few simple geometric principles. So for instance if someone wishes to work with a six pointed mandala I will introduce them or the group to what is involved. Each time I explore this a different process unfolds. This is because no situation ever exactly repeats itself. There is inevitably always a process of interaction and creativity arising and this leads to a new experience of the symbol concerned for myself and those involved. This is important because as far as possible I wish to present the mandala in a way which always has a quality of originality and inspiration. Other symbols and the associated geometry which often feature in my workshops are lotuses of one sort or another, spirals and crosses. I have also worked with The Sri Yantra and the Chartres labyrinth These are universal symbols that many people resonate with. Apart from the geometrical considerations of creating a mandala there is the subject of colour which is covered later. 4. Where do you draw inspiration to create mandalas? Inspiration comes from within. I first started seeing mandalas or geometric patterns in my minds eye also known as the Third Eye when I was still quite young. I did not know much if anything about the mandala at that point in my life. Sometime later the experience which involved “The circle dropping into consciousness” arose and then the circle and mandala symbols started to appear in my art work. At that time I was not an artist in any professional sense of the word. I just liked to draw and paint in my spare time. Later on I became aware of the mandala as an art form and realized how the symbols and images strongly resonate with the meditation experience. Subsequently the mandala has always been with me and I am inspired to work with mandalas partly because I greatly appreciate their beauty and also because I find their energy very magnetic. I do work with other images in a photographic context but the attraction of the mandala is such that I have not painted any other image for many years. The inspiration is an energy that I feel and which flows through me when I am painting. 5. What happens when you introduce color into a mandala? I would say that colour conveys a feeling element which enhances the geometry of a mandala. The actual effect is specific to the colours involved and their relationship with other colours in the mandala concerned. In terms of my own experience of the mandala between about 1973 and 1976 I was designing line mandalas. In 1976 which approximately coincided with the birth of my daughter I introduced colour into the mandalas. I am not sure why it worked this way but the timing was interesting! To start with my technique was fairly basic. I have learnt about mandalas through the experience of painting them. However I think I always have had a natural feel for and appreciation of colour tone and hue. I have mentioned the term “intuitive insight” earlier and I think this is also the place from which colour choice ideally arises. As is well known certain qualities are associated with specific colours though there are no universal standards in this respect as far as I can see. Colour choice is very personal and the effect of red for instance on one person may be very different to the effect on another. Colour is a universal quality of energy and we all resonate with it one way or another consciously or unconsciously. At one point I focused on what I considered at the time to be ‘spiritual colours” or “higher vibration colours” which as far as I was concerned were subtle tones of blue, lilac and gold. Later on I decided to approach colour from a more holistic perspective and include the whole spectrum. Although there may not be any universal principle in the sense of each colour means the same thing to everyone I think it is true to say that certain colours stimulate specific aspects of our being and energy field. When we work with that colour or look at the colour concerned we are activating the associated quality of consciousness and chakra. With that in mind I painted a series of mandalas which I have called “Shunyata Variations” which explores the energy of colour. In the series each mandala has a dominant colour and the colours either side of it on the colour wheel are also present. When painting each mandala or meditating on them one experiences the energy of the dominant colour and associated feelings. My feeling is that this general principle applies to working with mandalas and all images. In other words the artist and/or viewer of the art work experiences the energy of the form of the image and the energy of the colours of the image. 6. Tell me about your workshops? About twenty years ago I was asked to give a workshop and since then over the years have given them in a variety of countries, including the UK, Spain, Switzerland, Latvia and Lithuania. I see my mandala workshops as a context in which to explore mandalas and share energy in general. Over the twenty years the way I approach the workshops has changed and is significantly influenced by the people present and the place where the workshop is occurring. I have always taken a number of my originals with me as I think it is important to create a suitable ambience and atmosphere. Also the mandalas speak directly to people and that helps the process along. The workshops consist of a certain amount of meditation and discussion as well as drawing and painting. Exactly what happens is very much an “in the moment” experience and as far as possible I aspire to be sensitive to the needs of those present as and when appropriate. Generally speaking though not always participants want at some stage in the workshop to be shown how to draw and paint specific symbols so a certain amount of technical skill needs to be imparted. This can and often does take on a life of it’s own. For instance at one recent workshop there was a request to be shown how to create a Chartres Labyrinth and that led to the group creating a large labyrinth on the final day and walking it. This was not planned by me but I was very happy to “go with the flow” and be part of the creativity that was manifesting in such a beautiful way. Most of the workshops have lasted about two days which amounts to twelve hours but I have presented longer and shorter ones. Most of the time participants work by themselves but often in the last session a group mandala has been created. This can be a very beautiful and inspiring process and a group of people working together as one can be very creative. I have collected together many of the mandalas created on my workshops and posted them on my web site including some of the group mandalas. 7. Of all the countries your have visited can you tell me which one gave you the most inspiration and why? Would you say this country also influenced your design patterns and choice of colors used in the mandala? I think the answer to that has to be India. Mandalas are found universally but they are found in exceptional abundance in India. They are an integral part of the culture and are found on the streets as well as in the temples. However the inspiration is broader than artistic and includes the spiritual teachings associated with the country. Like many people of my generation I was drawn to the mystical teachings of the East and that led to a journey to India in my ‘20’s. In particular I was and am drawn to the teaching of Advaita Vedanta as presented by Ramana Maharishi who lived at the Sacred Mountain of Arunachala in South India. I was in India for about seven months and as well as visiting Ramana’s Ashram in the south traveled through India to The Himalayas in the north. In the Himalayas I spent time with the Tibetan Buddhists in Dharmasala. Later on I traveled to Rishikesh on the banks of the Ganges where the culture is predominantly Hindu. In all these locations the mandala was in evidence in a variety of forms. Although India is strongly associated with the mandala and spiritual awakening also termed Enlightenment it turns out that the energy of Truth is universal and that inspiration is to be found just about anywhere if you have the eyes to see it! So for instance in Scotland I spent time at the Findhorn Community and The Sacred Isle of Iona. In Wales in present time I live in an area rich in Sacred Sites going back before recorded history and natural beauty where the energy is strong and pure and conducive to creativity and the journey of awakening. In England I lived near the town of Glastonbury also known as Avalon associated with King Arthur and The Round Table. Likewise on my travels abroad there is always inspiration available if one is receptive to it for instance in the form of the mountains of Switzerland or the Cathedrals of France. More recently I have been to Eastern Europe where The Russian Orthodox Tradition is prevalent and encountered powerful symbols and images of the divine. With regards to being influenced by a given country in terms of choice of design and colour I would say that is a more subtle consideration. Although I have mentioned that India has been a major influence I would not say that my mandalas are particularly Indian in style though the lotus in a variety of forms has featured strongly in my work for many years. The same applies to my choice of colour. For instance in India they tend to use fairly strong or very strong colours whereas I prefer subtle hues and tones which I understand is more about having Venus in Taurus than anything else! I was already working with mandalas before traveling to India and I found that many of the symbols found in the West are also found in the East. So for example in the Inner Sanctum of the temple at Ramana Maharishi’s Ashram I found a six pointed star carved out of stone. Later in my life in 1998 in a Buddhist temple in Japan I found a mother and child carving very much like a Madonna and child. This relates to what I said earlier about the universality of symbols and the collective unconsciousness or transpersonal consciousness of humanity. The energy of Truth is universal and symbols representing that truth have a lot in common though there are definite cultural variations. 8. As elemental parts of the design used in Rainbow Lotus you use the yin/yang symbol with the lotus flower. Do you remember how you chose the color scheme for it? As we have discussed my mandalas have a personal and transpersonal aspect. To understand Rainbow Lotus I think it would help to understand the context in which it came into being. I have mentioned earlier that I have Venus in Taurus. An astrologer friend of mine pointed out that the Rainbow Lotus design looks very much like the glyph for Pluto. I knew from the beginning that the image was about Love and Relationship because it started as a line drawing which featured myself and my girlfriend. I also knew that this particular relationship was associated with strong and deep feelings and that the friend in question had introduced me to the yin yang symbol and given me a pendant of it. My book features the line drawing on which Rainbow Lotus is based and energy is represented as coming from the earth below moving through the bodies of myself and my girlfriend and then ascending to form an arch above us. The transition from a line drawing to colour was very quick and unexpected though with hindsight one can see how it evolved. I think it is the first mandala I painted featuring a Rainbow Arc and is the first one of a series of about six. One of the things which happens in relationships is that complimentary polarities become apparent and get activated. I think at that time I was moving away from my blue/lilac/gold rather rarefied stage to a more holistic grounded phase. However having said that the design still has a strong bias towards blue which being the colour of the sky and the ocean is often associated with Space Freedom and Peace. I think it is true to say that the central yin yang had already been painted as a design in it’s own right. The rest just flowed and I think it happened all in one afternoon . Just as I said earlier it is counterproductive to analyse “Intuitive Insight” so from my standpoint that applies to colour choice. To paint we have to allow the colours to talk to us and go with the creative flow rather than think about it. Other people have analysed Rainbow Lotus on several occasions and we all interpret what we see according to our personal dispositions. I think the best way for me to talk about the colours of Rainbow Lotus is to do so while looking at the design. As mentioned earlier there is a bias towards blue. The background colour is not far off the colour of the sky on a sunny day. From my standpoint this places the image in the presence of Space and Peace. The multicoloured Rainbow Lotus “floats” in a representation of water. The colours in the water range from deep violet blue to pale turquoise blue and there is light on and in the water emanating from the central petal in the lotus and touching or moving upwards to the yin yang. The lotus has nine petals and I realized subsequently that nine is the sacred number of Hinduism as however many times you multiply it the digits add up to nine so is a symbol of the Eternal Unchanging Oneness. The rainbow colours which are very much in evidence in this design happened spontaneously but I think were part of the aspiration to represent the totality of experience. The lotus below the horizon is very much part of the Rainbow Arc above the horizon. The colours below are stronger and the colours above more pastel. I have not thought of this before but in a way this represents the more dense energies of the material plane rising up to meet the more celestial ones. The design is surrounded by a Rainbow Circle which represents a kind of double unity in the sense that both the circle and rainbow or full spectrum symbolize the totality of being. 9. Do you have a clear idea or message when you create a mandala? As you have gathered from my previous answers there are ideas and feelings underlying each mandala but I would say my creative process is fairly fluid and the final outcome may turn out differently to what I had in mind at the beginning. In some cases I have had a clear idea what I wish to accomplish and at other times it’s much more a question of seeing what unfolds. My experience is that painting is very much about energy and feeling rather than carrying out a planned design of some sort. However having said that I should say that I have often copied my work on commission and can do so to a fairly high degree of accuracy. So I think in my case I need to differentiate between originating new mandalas and copying ones that already exist. The former is fairly fluid and the latter more planned and exact in intention and execution. Also I think it’s generally true to say the use of colour is more fluid than the drawing up of the geometrical framework upon which the mandala is based. This was not the case when I was just creating line mandalas when I used to experiment and play around with different geometrical possibilities. However in more recent years the experimental component has been more in the area of colour. Actually on considering that statement I’m not sure how true it is! There is still a degree of experimentation and exploration going on in the context of form and my use of colour is fairly established and uses techniques I have been using for years! The fundamental idea is to tune into and create a symbol which embodies the energy of Unity. All the different symbols have different qualities but are intended to communicate the basic principle of Oneness. Symbols I have worked with include, stars, crosses, flowers and lotuses, spirals, labyrinths, yantras and so on. All of these respective symbols have ideas associated with them and working with them would involve a degree of preliminary intention. I think a good way to explore this would be to take another design and depending on how long we have I can explore this consideration further. 10. In your book Sacred Circles you make reference to the unique qualities of the circle. Is this your favourite shape to use in mandala design? As I understand it the word mandala is based on a Sanskrit word meaning Great Circle. For me it is the basic shape upon which all mandalas are based. A circle always has a centre and a saying I like is “The centre is everywhere and the circumference nowhere.” It indicates that the circle symbolizes transcendental consciousness, the Source and Oneness. So I would say for instance that a six pointed star directly or indirectly incorporates the geometry and energy of the circle. The same would apply to most if not all of the mandalas I have painted. The circle is always present to a lesser or greater degree. When I first started working with mandalas I was surprised when someone said to me that a circle is a rather confining shape. I had always seen it as a very liberating one! However later on I came to the conclusion that although I feel that the circle is a liberating and expansive symbol how one incorporates it into a design can effect whether it is seen as limiting or expanding. Balance is the key. Too much expansiveness can lead to a feeling of too much movement and too much containment can lead to a feeling of limitation and stasis. In most cases mandalas are an exploration of both these principles which are complementary opposites like yin and yang. The circle has a special place in my consciousness because as I have said it dropped into consciousness at a significant time in my life. 11. Having enjoyed reading your book Sacred Circles I wonder if you have plans for a new book in the future featuring your latest mandala creations? My book Sacred Circles came together about ten years ago when I was working on a project with friends who are involved in the healing system known as Aura-Soma. We were proposing to make a mandala video and felt that the video would be enhanced by some text to accompany it. As it turned out the video never reached completion or rather perhaps I should say is still ongoing! I do occasionally consider modifying, updating, and rewriting the existing book or writing another one altogether. I have actually been involved in the writing of two other books earlier in my life but Sacred Circles is the only one that I have circulated and that has been possible because I have a good printing set up in my office and studio. More recently I have made it available as an ebook. In the last ten years a number of new mandalas have come together and most of them are on my web site. I do not currently have in mind to put together another book though with encouragement it might happen. Another creative activity I have been exploring the last ten years or so is photography so it might be interesting to incorporate some photographs into my next book. Originally I started out collecting together photographs of what I call “natural mandalas” such as for instance flowers but somewhere along the line I started photographing anything which appealed to me! In fact for a while a few years ago I spent quite a lot of time making cards and prints for sale of local scenery. This activity seemed to fit in well with my work with mandalas and developed at about the same time as I started working with computers which has facilitated all kinds of possibilities in terms of communication and publishing including this interview! 12. I noticed you use Rainbows in your work. Have you ever been inspired to create a mandala from seeing Rainbows? The first time I really remember thinking about rainbows was when I was living on Iona the sacred isle on The West Coast of Scotland. I was sitting in a cafe and someone started talking about how rainbows are one of the most magical phenomenon in nature. Synchronistically I was also living in a house where a friend had a glass crystal in the window which refracted the sun and made rainbows on the walls! Just how, when and why different energies and colours come into ones life is something of a mystery but I think when consciousness is ready to receive a specific quality of energy that energy appears. So in that context at that point in time I was ready to receive the message of the rainbow. However I do n’t think the rainbow started appearing in my mandalas for a while though tuning into the rainbow might have been part of me beginning to incorporate the full spectrum into my work. I think it’s true to say that the rainbow as an outer phenomenon and as a symbol of an internal energy and understanding has inspired and been an integral part of my work for quite a while directly and indirectly. However I do n’t think I have ever seen a rainbow and then gone back to my studio and painted one. I think it’s true to say the rainbow is a universal phenomenon that people all over the world appreciate and it stimulates a sense of magic, wonder and sense of beauty. As such it inspires and connects us all to The Divine. Rainbow Lotus is the first mandala I painted with an obvious rainbow theme. it was followed by Flying Lotus, Heart Lotus, Winged Lotus and Crystal Lotus. These were all painted or designed in the 80’s. In the ‘90’s I explored the rainbow theme in the series I have called Shunyata Colour Variations. With Shunyata only a small section of the spectrum is present in each mandala but as a set they cover the whole spectrum. One of the interesting effects that people have noticed with the Shunyata Series is that the complimentary colours sometimes appear. This is a visual effect which involves the eye seeing the opposite colour to the one it has been looking at. The mandala which represents a synthesis of my rainbow series and shunyata series is Oneness. In that design the full spectrum is represented in a spiral formation with the light shining through. It is also a synthesis of my work with the paint brush and the computer as it is a computer modification of one of my mandala paintings. 13. Many cultures have their own unique style of mandala: the sand mandala's of Tibetan Buddhist Monks, the Hindu Yantra from India, the medicine wheel of the native north American Indian and of course natures own mandalas such as snowflakes and flowers. Do you have any favourites and why? I appreciate and have been inspired by all the examples you have mentioned including other forms such as for instance the rose windows in churches and cathedrals. I am not sure which is my favourite though ultimately it has to be the inner light shining within and as consciousness. The first mandala that really spoke to me was The Empty Circle which features in The Secret of the Golden Flower. As an image the empty circle is about as simple as it gets! Not far off the empty circle is the golden orb of the sun which is a more radiant image and many cultures have included the sun in one form or another in their sacred images. The setting sun must be high up in the list of my favourites and I would say that it is a mandala. Many people sit and watch the setting sun delighting in its beauty without thinking of it as a mandala but I would say it can be seen and appreciated as such as well as simply as what it is! You have mentioned many mandala forms but there are others such as the labyrinths and also the three dimensional mandalas in the form of temples, cathedrals and so on. The great cathedrals and temples of the world are truly mind blowing and the general opinion is that the cathedrals were built at a time when there was a degree of understanding of sacred geometry and geomancy that was lost somewhere along the line in Western Civilization. Then of course there are the Stone Circles to consider! They are definitely high on my list of favourites. It is beautiful to walk in nature to a place of great beauty to visit an ancient stone circle and feel the connection with nature, the universe and the culture that built the circle. As for Tibetan sand Mandalas they have to be seen to be believed! Tibetan monks travel the world creating these sand mandalas which they then recycle in the nearest river so that the blessings of the mandala enter the river, then the ocean and then in due course evaporate to form rain and fall as what is called “The Rain of Blessings”. This cyclic theme reminds me a of a poem by Ramana Maharishi which I sometimes quote on my workshops as it beautifully represents in a poetic way the circularity of life and how we all come from and eventually return to the source. The waters rise up from the sea as clouds, then fall as rain and run back to the sea in streams; nothing can keep them from returning to their source. Likewise the soul rising up from Thee cannot be kept from joining Thee again, although it turns in many eddies on it’s way. A bird which rises from the earth and soars into the sky can find no rest in mid-air, but must return again to earth. So indeed must all retrace their path, and when the soul finds the way back to the source, it will sink and be merged in Thee, O Arunachala, Thou Ocean of Bliss! in silence it falls away. This links in with your next question because when we first created a leaflet for Mandala Prints we included this poem in the text. Most of my adult life I have been working with mandalas and along the way have sometimes collaborated with friends and fellow mandala artists. In the ‘70’s a group of us had a stand called “Painted Shields” at the first Festival of Mind Body and Spirit in London. We were all living on the West Coast of Scotland at the time so it was quite an undertaking to get all our work to London. After that we all went our separate ways for a few years though I did meet up with and collaborate with at least two of the friends involved in later years. In particular I met up with Mike Booth and started Mandala Prints. For many years Mandala Prints printed published and distributed the work of myself, Mike and his wife Claudia. In present time Mike and Claudia are busy with their work with Aura-soma but I continue to print and publish my work. Myself, Mike and Claudia still collaborate now and then on mandala projects of one sort or another. In particular I have given talks and workshops at the Aura-Soma Centre in England and we have also all exhibited together there. 15. All of my students are women in transition facing life changing events. What advice do you have for them when they begin to work on their own personal mandala? Well this feels like the most difficult question to answer. This is partly because it refers to women whom I have never met and also because advice always needs to be fine tuned to fit the requirements and needs of each individual. However I will share a few ideas which I hope are helpful. I consider working with mandalas to be very much a part of my healing and spiritual journey. This is partly because I feel that creative expression in general is healing in itself and facilitates insight and also because mandalas themselves have healing qualities. One principle which is an integral part of understanding mandalas is that everything is interrelated and forms One whole. When we open ourselves to the energy of mandalas we are in a sense placing ourselves in the presence of the healing energy of Oneness. If we approach creating a mandala from an empty space with no preconception of what may or may not arise that is rather a different approach from working with a traditional mandala image. In the former case we are undertaking a journey of self discovery which may for example reveal aspects of our psyche that we are unfamiliar with. In that situation I would recommend people to be open to what unfolds and to go with the flow. When working with a traditional mandala messages from another dimension whether termed unconscious, subconscious or super conscious may indeed arise and again I would suggest being open and receptive to whatever arises. The journey such a creative exercise activates and facilitates will from my experience be unique to each individual. This requires and facilitates a unique response! The process sets in motion a dialogue with parts of oneself and in as much as the mandala is a symbol of The Self it facilitates a meditative state and a deepening of understanding. For me the healing journey has involved working with a variety of systems and approaches along with mandalas. So for instance I have made a study of nutrition, a variety of systems of hands on healing, astrology and have been around quite lot of people who work with colour healing and a variety of systems of psychotherapy and so on. As I have said one of the basic principles of mandalas is that everything is interconnected so I feel mandalas support wholistic healing in general and the idea that at different times different and specific energies are required. Another major influence in my life has been the teachings of Enlightenment and this involves the recognition that true healing requires a transformation of consciousness.